I found this story to be a little less formulaic than the other stories I have read by Dickerson. For one, instead of having a naive, literate, and independent woman, Rapunzel is, by contrast, illiterate for at least the first third of the book, naive, and completely dependent on her mother for most of the book. 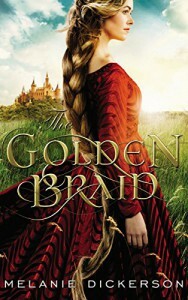 What struck me as interesting was Rapunzel's dynamism in this book. As soon as she learns to read, she starts questioning almost everything her mother taught her, and even goes so far as to get a job about halfway through the book. The religion in this book played a much larger role in this than in the other books I read by Dickerson, but again, it still makes sense. Because Rapunzel is illiterate to start out with, one of the easiest books to get in print at this time was the bible, so it makes sense that she would have memorized parts of the bible. When she's kidnapped, it basically needs a miracle for Garek, the knight who teaches her to read and ultimately befriends her, to find her, so it makes sense for him to experience divine intervention. Overall, it wasn't overly jarring to the plot of the story, but it was still there. I really liked Garek's transformation from a guy who was only interested in proving himself better than his older brother to a man who was okay with not having huge tracts of land or many riches. It was really interesting listening to his inner monologue, which features much more strongly than in the other Dickersons I read. It was really quite interesting and lent a lot to the plot because we got to witness more of his transformation as a person. Overall, I recommend this story to others. It is a really fun tale with quite a few good plot points.